St. Martin's Griffin, 9781250068286, 336pp. Blending witty travelogue with action on the field—and shady dealings in back rooms—George Vecsey offers an eye-opening, globe-trotting account of eight World Cups. He immerses himself in the great national leagues, historic clubs, and devoted fans and provides his up-close impressions of charismatic soccer stars like Sócrates, Maradona, Baggio, and Zidane, while also chronicling the rise of the U.S. men's and women's teams. Vecsey shows how each host nation has made the World Cup its own, from the all-night street parties in Spain in 1982 to the roar of vuvuzelas in South Africa in 2010, as the game in the stadium is backed up by the game in the street. But the joy is sometimes undermined by those who style themselves the game's protectors. 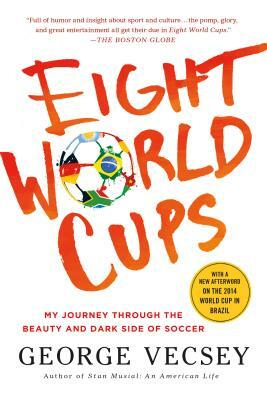 The paperback edition also includes a new afterword about the 2014 World Cup in Brazil, which reached new levels of excitement and interest, especially in the United States. Vecsey's sharp reporting and eye for detail make his book an unforgettable journey. George Vecsey has written more than a dozen books, including the bestseller Stan Musial: An American Life. He joined The New York Times in 1968, wrote the "Sports of the Times" column from 1982 to 2011, and is now a contributing columnist. He was honored in 2013 by the National Soccer Hall of Fame for his contributions as one of the first columnists at a major U.S. newspaper to cover the sport. He lives in Port Washington, New York.